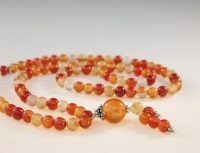 $5 off any set of prayerbeads until March 12, 2019. A coupon for $5 off every set of prayerbeads will be in your cart. Just click on that coupon on the cart page during checkout to apply the discount. 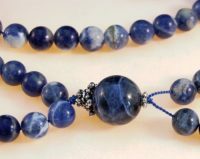 Bahai Prayer Beads are handmade with 95 semi-precious gemstones plus 5 counter beads. We string them loosely so they will feed good and pass easily between your fingers as you pray. Each set of prayer beads comes with a copy of Gift of Prayers as well as a fold-out instruction sheet with prayers, a pronunciation guide and an explanation of some of the many ways to use prayer beads. We also package them in a color-coordinated velvet, drawstring pouch. So they make an attractive gift. Have you noticed how a beautiful, peaceful environment can help you achieve a more reverent attitude? 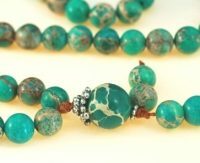 Exquisite, semi-precious stone prayer beads can be a part of that. We string them right here at Special Ideas as an act of service and put care and craftsmanship into each set. This effort is matched by the delicate beauty of the beads themselves. Each stone is like a little work of art with God’s signature. Because they are moderately priced, prayer beads make excellent gifts for special occasions like birthdays, Holy Days, anniversaries, graduations, or when someone becomes a Bahá’í. The beads we use are 6mm round and the full strand is about 22-23″ inches in circumference. This allows them to double as a necklace for people who wear a small hat size.